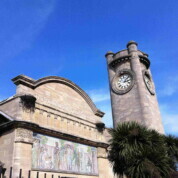 If you’ve never been to the Horniman Museum, it’s well worth a visit from any part of London. Its eclectic mix of exhibits, inspired by (and incorporating) the personal collection of Victorian tea merchant Frederick Horniman, ranges from stuffed animals to musical instruments via tribal masks and other anthropological treasures. Children can get stuck in at the Hands on Base areas throughout the museum, trying out musical instruments and learning about the natural world. On top of the main collection, there is an aquarium, animal enclosure, musical instrument garden, and beautiful expansive gardens with views across London. Look out for the temporary exhibitions and the regular family activities which take place both indoors and in the gardens throughout the year.